The mineral known in the gems world as idocrase actually has two names -- idocrase and vesuvianite. 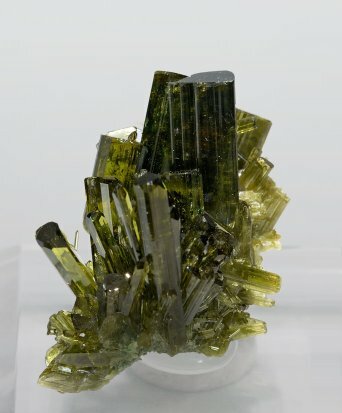 It was first given the name vesuvianite in 1795 by the well known German mineralogist Abraham Gottlob Werner, since the first specimens were found adjacent to the Mt. Vesuvius volcano in Italy. Four years later, the French mineralogist Rene Just Hauy suggested it should be named idocrase instead. This name, which derives from the Greek works idos and krasis for "mixed form," refers to the many forms that idocrase may take, from short pyramidal to long prismatic crystals that range from columnar to massive to fibrous in form. Both names have been used interchangeably, but the name idocrase seems to have become more common for gem-quality specimens. 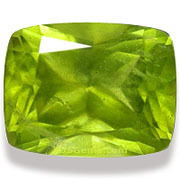 Gem-quality idocrase is rare, and is usually green in color. It can easily be confused with peridot. Most idocrase is opaque, with some resemblance to low quality jade. Transparent material that can be faceted is very rare and can usually be found only from specialized gem dealers. This is a collector's gem that you won't find in retail jewelry stores. By chemical composition, idocrase is a calcium magnesium iron aluminum silicate hydroxide. It has a density similar to tanzanite, with a refractive index slightly lower than spinel and garnet. Idocrase is a bit softer than quartz, with a rating of 6.5 on the Mohs scale. Idocrase or vesuvianite is found in a number of locations in the world. They include Quebec in Canada, Mt. Vesuvius in Italy, the Ural Mountains in Russia, Switzerland, Indonesia, Kenya and Tanzania. But there are very few sources of gem-quality crystals. Recent finds in East Africa resulted in a limited supply of some good stones in the market.